This system inspection/maintenance tool allows you to explore Windows Protected Storage. This Windows feature is not documented and is known only to professionals. With Secret Explorer you will be able to become a professional, too. You will be able to locate hidden information in any Windows-based system. This includes web form autocomplete data from Internet Explorer; passwords for password protected websites; MS Outlook account and identity passwords, dial-up passwords and other data that Microsoft decided to store there. With the unique import/export feature of Secret Explorer you can move all your personalized data (such as IE web form autocomplete data and stored passwords) from one computer to another, basically familiarizing the new system with you. XML Reports. Standard version can generate plain-text reports only. OLE Automation. Professional version supports OLE Automation, so you can control it from your applications. Scripting support. You can write macros to control Secret Explorer using Visual Basic Scripting. Professional version is designed for advanced use such as investigation and forensic examination. 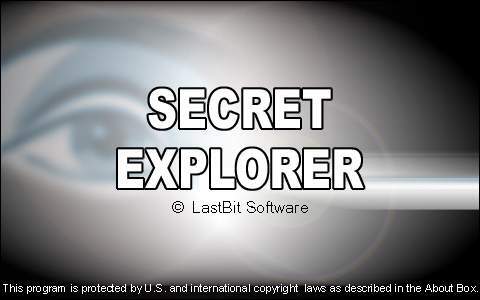 Note that Secret Explorer v5.0 has built-in auto-update feature, so you will be notified about new releases (if internet connection is available). Windows 95/98/Me or NT 4 / 2000 / XP / Vista, Internet Explorer v4.0 or higher. Alien Registry Viewer. Alien Registry Viewer is similar to the RegEdit application included into Windows, but unlike RegEdit, it works with standalone registry files. 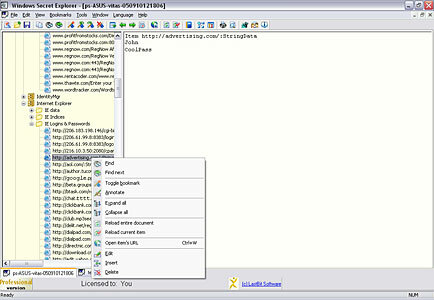 While RegEdit shows the contents of the system registry, Alien Registry Viewer works with registry files copied from other computers. Find Password Protected Documents is a utility to search for password protected (encrypted) documents on your computer. Current version analyzes Word, Excel documents (passwords to open), Access databases (share level passwords), Outlook PST files and Zip archives.